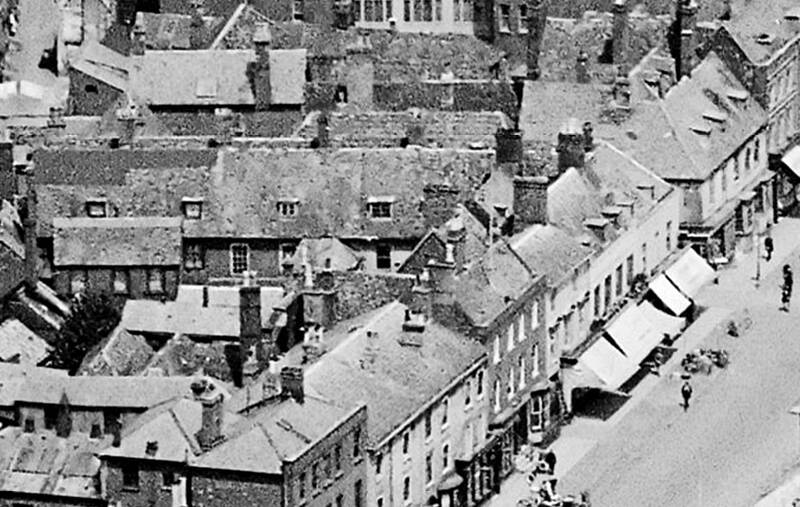 Alington House is the four-window wide building just to the left of the shop awnings in the aerial photo from 1920 below. To its right at No.106 High Street is Phoenix House, the distinct building with pediments above each of the three first-floor windows (still there today). What's not obvious is why at ground level the shop fronts span the join between these two buildings. Also the street numbering of the shops along this area is quite odd - No.108 seems to be the offices above and behind No.106 & No.112 (it doesn't have a shop front of its own) ... and No.110 High Street doesn't exist! 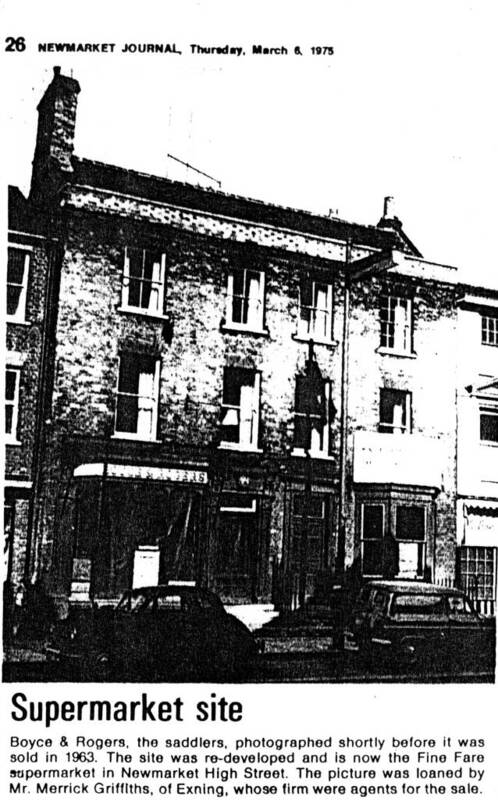 Alington House was demolished when the supermarket was built (Elmo's & then Fine Fare), but the new shop still spanned the join between the two buildings - the entrance being in No.112, the left-hand part of Phoenix House and the remainder of the shop to the left was in No.114. 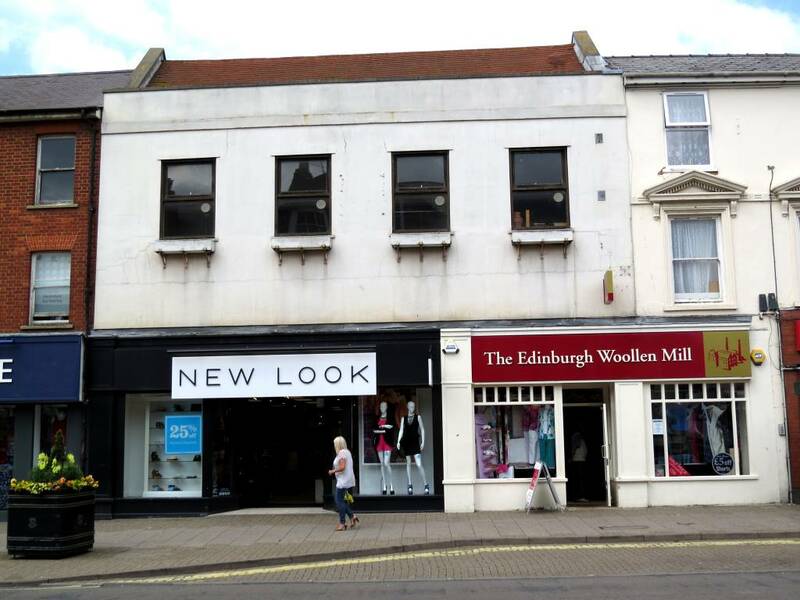 This situation hasn't changed much, as even now the Edinburgh Woollen Mill still has one half in each of the two buildings (see photos below). Boyce & Rogers featured in the 1954 film 'The Rainbow Jacket', in which the film shows a stuffed horse in the shop - 'Robert the Devil' - the 1880 winner of the St Leger. 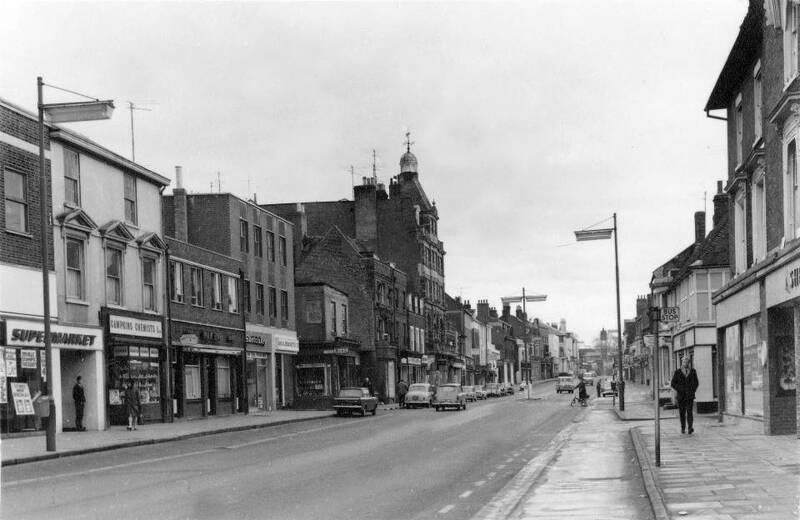 When Gibson Saddlers bought the shop in 1963 they also acquired 'Robert the Devil'. As detailed in the above newspaper advert Boyce & Rogers was started sometime before 1815. The cornerstone behind the business appears to have been Harriett Boyce, born Harriett Rogers on 23rd November 1814 in Newmarket, to Joseph Rogers and Sarah (née Edwards). Married on 13th March 1835 at St Mary's, Newmarket, in 1839 it was her husband Charles Boyce who was running the business, although, having been born in 1805, he couldn't have started the company if it was already going in 1815. Charles died in 1855 and Harriett continued running the shop - in the 1861 census Harriett was living here as the Saddler employing 3 men & 2 boys. The business wasn't known as Boyce & Rogers until sometime after 1851 (and most probably after 1861). Although Harriett's maiden name was Rogers, it appears that the Rogers in the shop name was most probably her solicitor nephew, another Joseph Rogers, who seems to have been her business partner and also her household companion from at least 1871. It's not known exactly what the circumstances were, but listed in the 1891 Street Directory, Boyce & Rogers open-end a second shop at No. 61 High Street - Holland House. This can't have lasted long as by 1897 Turf Commission Agent Mr. Browning owned that building. 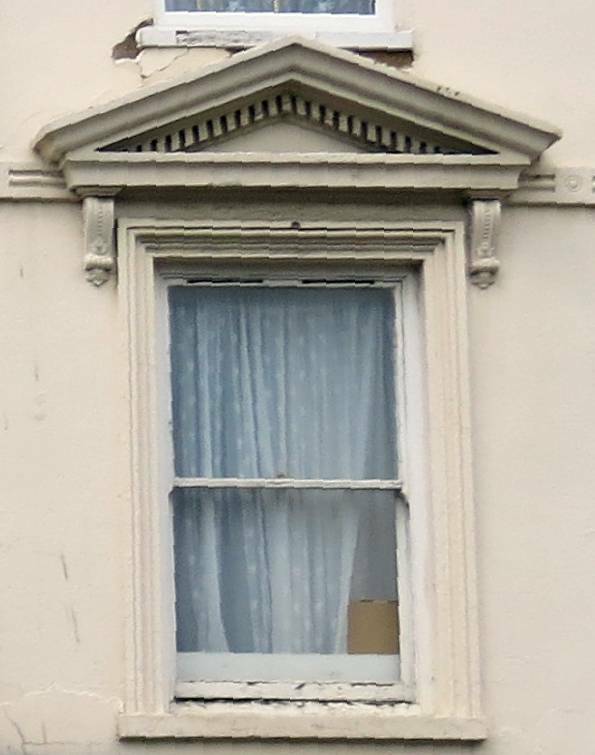 Harriett died on 25th August 1892 and Joseph continued on living in Alington House until his death on 24th July 1904. There's also another unexplained anomaly associated with the shop, as in the 1926 Street Directory a Turner & Co., saddlers seems to be listed at the same location as Boyce & Rogers - maybe they operated their business under the same roof (?) - if anyone has any details about this please E-MAIL me. Daniel Whisker was born in 1860 in Hammersmith, London. In 1891 he was a saddler living in Queen Street, Newmarket and in 1894 he had a house built in Doris Street, where in 1901 he's listed as a foreman saddler. In 1911 he was the master saddler, living here in Alington House, where he stayed until his death on 14th April 1934. It does appear therefore that Daniel had become the new owner of Boyce & Rogers. His son, Edgar Canham Whisker, continued running the shop, living here until his death on 1st November 1962. This date seems significant as Boyce & Rogers was subsequently purchased by Gibson Saddlers in 1963 and this shop was closed. It's not known exactly in which part of these buildings Harry had his shop (it was most probably the small section where the entrance into the supermarket was), but he's only shown as living here in the 1881 census. By 1891 although his shop was still here he was living in Burleigh House in Wellington Street. Harry died in Newmarket on 20th January 1940.